The current political crisis in <?xml:namespace prefix = st1 ns = "urn:schemas-microsoft-com:office:smarttags" />Kenya is attributable to a failure in leadership. None of the protagonists (Mwai Kibaki and Raila Odinga) could bring themselves to rise above their individual interests in securing power. They have both deliberately trampled on the national interest in their search for personal fulfilment. Kibaki, seeking to extend his State House tenancy undoubtedly stole the election, and thus brought us to the brink of this precipice. However, Odinga's reaction to this injustice is what is now threatening to push us over the edge. Over the past week, Kenyans have been disabused of the notion that we are somehow immune to the sorts of state collapse and genocidal tendencies that characterise some parts of Africa. Long touted as "an island of peace and stability" we have suddenly come face to face with the reality that underneath the seeming calm lies a smouldering volcano of disaffection, hate, desperation and fear. It is no coincidence that most of the carnage we are witnessing on our TV screens is visited upon the poor, by the poor. I live in a middle class housing estate, only a few hundred metres from the Kibera slums. Yet, the place is no need of police protection. None ofthe rioting mobs has ventured close in spite of the lack of a police presence. While looting, chaos and death have reigned within the slum, we have been carrying on as normal, only slightly inconvenienced by the fact that the supermarkets, restaurants and bars were closed. What we are witnessing in Kenya is more than just a political crisis with ethnic overtones. It is the result of decades of unequal development that has led to one of the most inequitable societies on earth. The richest 10% (who are drawn from almost every tribe) of our society control the vast majority of our GDP. The people rioting in the streets are part of the 46% of our population that lives on less than $1 a day. They have nothing to lose. Five years of steady economic growth under Kibaki has clearly demonstrated to them that even in boomtime, they will gain nothing. The UN's Human Development Index indicates that they are worse off today than they were five years ago. Inflation is running at levels not seen since the economic collapse of 1990s. So they jump onto the ODM bandwagon which promises more equitable distribution of resources. It is immaterail that the populist Odinga is one of the wealthiest people in the land. It is also immaterial that he once joined the kleptocratic former President Daniel Arap Moi in government (ironically denouncing the sorts of unlicensed political rallies he is calling for today as "treasous"). All that matters is that he is offering an alternative (however illusory) to a deperate and marginalised people. It is the proverbial straw that the drowning man will clutch for. Yet, as events in past few days have demonstrated, neither Odinga nor Kibaki have much regard for the suffering of their fellow Kenyans. They are content to issue alarmist and inciting statements from the comfort and safety of their fortified, luxurious homes. Each passing day, they polarise the country further with their political brinkmanship. However, the country is fighting back. Led by the media, artists, businesspeople and trade unionists; many are rejecting the slide towards anarchy. In this, I find a great deal of hope. For if we can develop alternative centres of power and influence, and rob the political class of the all-encompassing grip it has on our collective throat, then future political problems can be quarantined within the political sphere and not allowed to infect the rest of society. 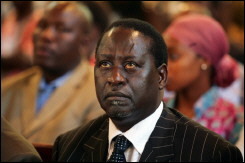 Main picture: Opposition Leader, Raila Odinga.